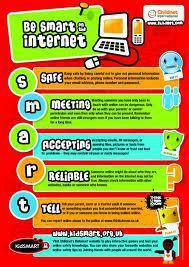 E-SAFETY FOR KIDS - STAY SAFE ONLINE! Firstly, remember the SMART rules! Our E-Safety Squad have been designing presentations wot help you to remember how to"STAY SAFE ONLINE". This has been recommended by ESAS, please pass on to parents.